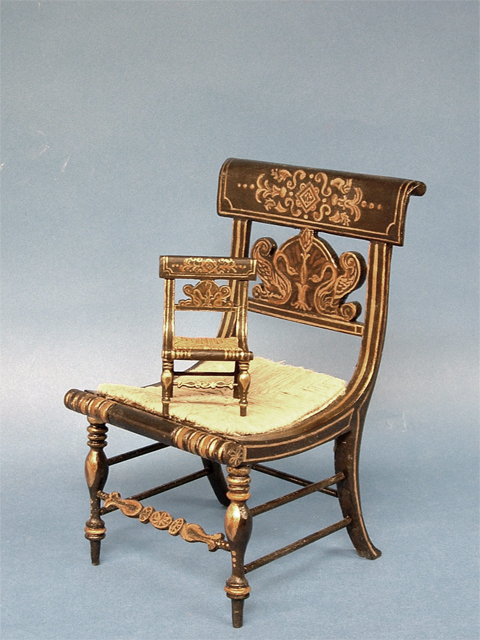 1810 period Fancy Painted Baltimore chair. it stand 9 inches tall and 5 inches wide. It feature all hand painting and gold leaf detailing. It has hand carved turnings and a hand woven rush seat. a true miniature. to order a chair in a specific size please e-mail me with the dimensions and I will gladly quote you a price. Web Development by SDAC Inc. Copyright Robin Thompson © 2019. All rights reserved.